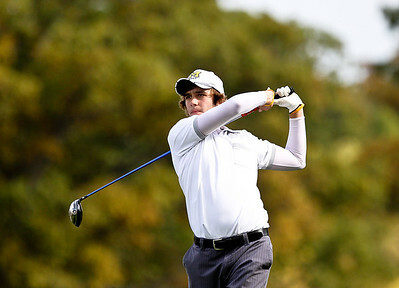 Josh Peckler - Jpeckler@shawmedia.com Prairie Ridge's Pat Biewald tees off on the 13th hole during the Fox Valley Conference Boys Golf Meet at Crystal Woods Golf Club in Woodstock Thursday, September 27, 2012. 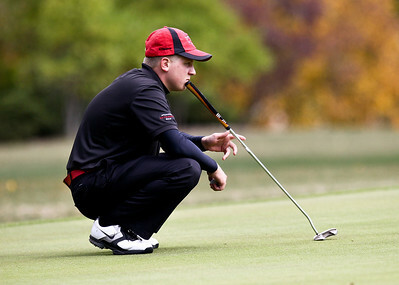 Josh Peckler - Jpeckler@shawmedia.com Huntley's AJ Fanselow focuses on his put on the 13th green during the Fox Valley Conference Boys Golf Meet at Crystal Woods Golf Club in Woodstock Thursday, September 27, 2012. Josh Peckler - Jpeckler@shawmedia.com Hampshire's Geoff Beck watches his shot on the 12th hole during the Fox Valley Conference Boys Golf Meet at Crystal Woods Golf Club in Woodstock Thursday, September 27, 2012. 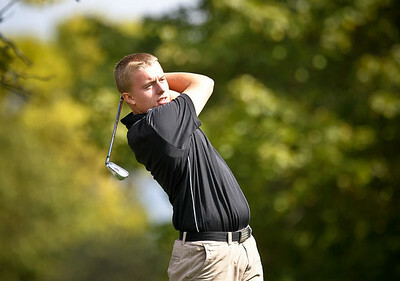 Josh Peckler - Jpeckler@shawmedia.com Dundee Crown's Andrew Livengood watches his shot on the 16th hole during the Fox Valley Conference Boys Golf Meet at Crystal Woods Golf Club in Woodstock Thursday, September 27, 2012. Josh Peckler - Jpeckler@shawmedia.com Woodstock's P.J. 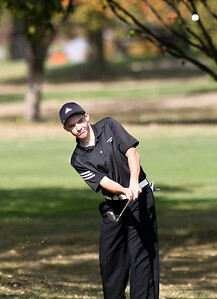 Senn chips up a ball onto the 12th green during the Fox Valley Conference Boys Golf Meet at Crystal Woods Golf Club in Woodstock Thursday, September 27, 2012. 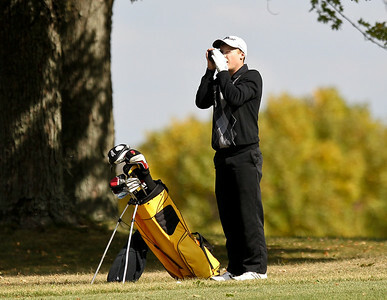 Josh Peckler - Jpeckler@shawmedia.com Jacob's Jack Ramsett uses a range finder to check his distance from the 13th hole during the Fox Valley Conference Boys Golf Meet at Crystal Woods Golf Club in Woodstock Thursday, September 27, 2012. 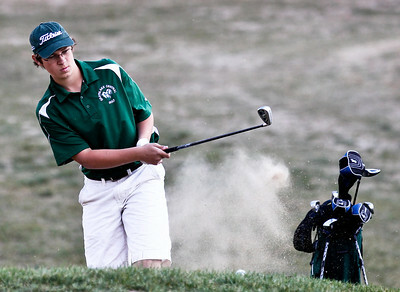 Josh Peckler - Jpeckler@shawmedia.com Crystal Lake South's Brandon Dahl checks the green of the 12th hole during the Fox Valley Conference Boys Golf Meet at Crystal Woods Golf Club in Woodstock Thursday, September 27, 2012. 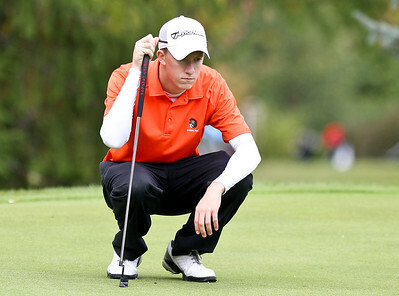 Josh Peckler - Jpeckler@shawmedia.com Mchenry's Riley Lindholm checks the green of the 16th green during the Fox Valley Conference Boys Golf Meet at Crystal Woods Golf Club in Woodstock Thursday, September 27, 2012. 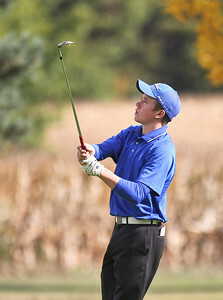 Josh Peckler - Jpeckler@shawmedia.com Johnsburg's Zach Matejka watches his shot on the 12th hole during the Fox Valley Conference Boys Golf Meet at Crystal Woods Golf Club in Woodstock Thursday, September 27, 2012. 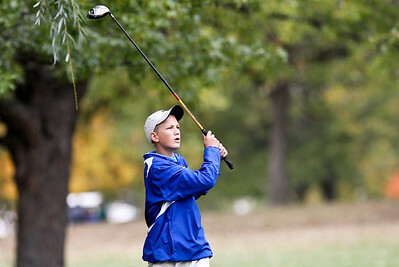 Dundee Crown's Andrew Livengood watches his shot on the 16th hole during the Fox Valley Conference Boys Golf Meet at Crystal Woods Golf Club in Woodstock Thursday, September 27, 2012.